What I drank prior: at least 8 beers and a half bottle of wine. you think i’m lyin? it happened. Hokay, so. Obviously this is about Jack the Ripper. He’s a scary dude. This YA retelling is about the girl that tries to take him down. She’s a girl, in 19th centruy england, trying to learn how to be a medical examiner and do autopsies. SHe’s all like, teach me bruh. Her uncle’s like…. K. Dad doesn’t like it. Mysteries happen, she tries to fix it. You guys, i wanna like this book. 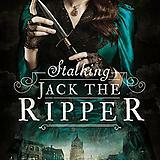 Stalking Jack the Ripper sounds super duper fun. But its basically a mystery that you can predict from the beginning. Characters: Okay, fine. I LOVED the characters. Like legit, all of them are wonderful. Kerri does a great job developing characters that I fell deeply in love with. and it makes me really really embarrased that i did. Writing Style: I liked that they had photos of various points in the story. They helped me figure out what was going on. ALSO, her wtriting style was good enough for me to fall in love with the characters. So. Yeah. What to pair it with: Miller lite. Its fine. Like, it will do the job, it will get you drunk, but its not great. Rating: 3/5 shots. That’s all I got.